The new schedule of Spring Talks is now available. Please note them in your diaries and book your place early as they are always well attended! All talks are held in the Tennis Pavilion, Tattershall Drive, beginning 7pm. 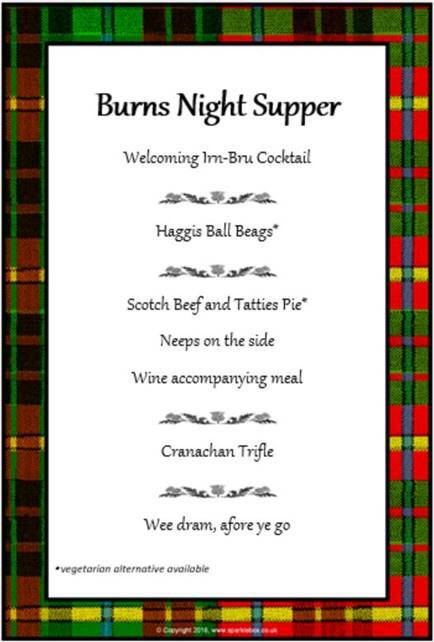 Just a few places left for the Burns Night Supper at the Park Tennis Club this Friday night. 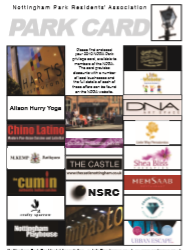 The pink-coloured Park Card for 2019 is on its way out to NPRA members, together with this year’s list of local discounts. Hope you will be able to join us on Friday 25th January (from 8pm) to celebrate the life and work of the Bard. 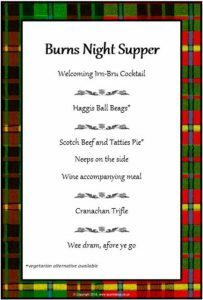 Three course menu including haggis, poetry, tipples. Vege options available. Lots of tartan on display but appropriate Scottish dress is not discouraged. Cost £27 per person – numbers are very limited, so please book early! The latest list of planning applications, registered with the City Council, are available for comment. Back after a year’s break to renovate the Tennis Club pavilion, this one’s not going to disappoint! It’s “War of the Worlds” – that’s Martians for those too young to remember being invaded by anything worth worrying about. To receive a monthly email, please sign up to the Alerts system at the Park Estate website (“Register” button at foot of page). The Local Government Boundary Commission for England (LGBCE) has announced the final recommendations for ward boundary changes in Nottingham. The new ward will come into force in the May 2019 City Council elections. The full report and map are available at https://www.lgbce.org.uk/all-reviews/east-midlands/nottinghamshire/nottingham, however, a summary is below. The Commission changed its initial recommendation for separate City and The Park wards. Feedback during consultation suggested that many people living in the proposed The Park ward used facilities and amenities in the city centre and that the two areas should be combined into a single ward. The Commission found the local evidence to join the two areas together persuasive and now proposes a two-councillor ward to cover the central part of Nottingham. The ward will be called Castle. 58. The Conservatives and five other submissions supported a City ward, arguing that the city centre is very different to its surrounding communities and therefore has very different needs and interests. Most residents in City live in apartments surrounded by shops, restaurants, bars and offices. This is unique in Nottingham and the proposals reflected that. 59. The Conservatives and 31 other submissions supported The Park ward, arguing that it reflected the community and did not dilute the voice of the Park Estate by merging it with any of its neighbouring communities. 60. The Council and 30 other submissions objected to either a City or The Park wards, with most of the residents writing in support of the Council’s alternative proposal, which was to combine the two wards. The submissions pointed out that the Park Estate itself is purely residential and that the people who live there primarily use shops and social facilities in the city centre. In addition, by the Council’s estimate, only 55% of The Park’s electorate live in the Park Estate itself. People living in flats on The Ropewalk or Castle Boulevard in ‘The Park’ ward saw themselves as city centre residents and did not identify with the Park Estate in any way.